Kattaikkuttu performances are booked and paid for by ordinary rural people. 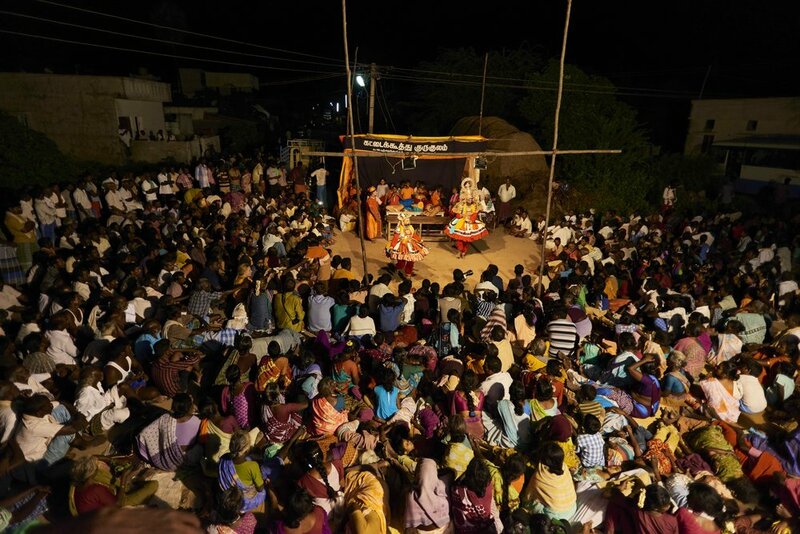 Night-long performances are integral to a rural, agrarian culture that celebrates the end of the planting of new crops, the coming of the monsoon and the harvest through seasonal, religious festivals. Kattaikkuttu performances are put on to ensure the well-being of the entire village community. In addition to their ritual function, these performances are also thoroughly engaging and entertaining events. They enable rural people to see themselves, their family dramas and the dilemmas and controversies they face in everyday life, acted out on the stage. Kattaikkuttu’s performance season runs from mid-January to mid-October. After the start of the monsoon in October open-air performances are few and far in between. All-night village performances are free and can be attended by anyone who is able to figure out their exact location. The calendar of our upcoming performance dates can be found on the Home page. Performances at urban locations and cultural festivals usually are of a shorter duration and often are ticketed.